This month we asked Caitlin what her pick is. Caitlin is one of our wonderful Retail Associates! 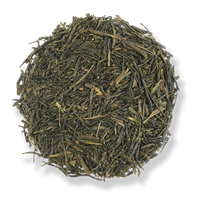 Her pick of the month is Eiju Sencha! C: Because it tastes good and I think it is fun to brew! C: Heaping teaspoon with six ounces of 145° water for three minutes. C: It helps me zen out. C: Happy and calm. It's as if everything is a little more beautiful, the trees, flowers, etc. Is it particular to this season? C: It's a great spring tea because it tastes so fresh and the cooler brew temperature. C: My mom, because she really likes Japanese green teas.